Loopmasters announce one of the most anticipated sequels from their acapella series. 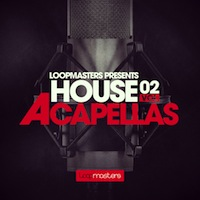 House Acapella’s Vol2 comes loaded with a fresh set of hot vocal performances written and produced by Andy Lee and performed by some of the best session vocalists working and recording within the dance music scene today. Female vocals are provided by Leanne Lawson & Natasha Watts, male vocals provided by Mike Prempeh. Everything is supplied 100% royalty free and this means that you can do exactly what you want with the content, chop it, process it, layer it, use long or short sections and mould it to your sound. Only the best mics, pre amps and signal paths have been used recording every detail of these amazing vocalists in the studio. Acapellas are a goldmine for producers worldwide and this collection will not fail to deliver, you get verses, bridges, chorus plus additional harmony and single word phrases making it a breeze to arrange and remix the stems to your preference. With world class vocal performances from in demand vocalists your tracks can take on a whole new level of popularity when performed and released – and the cool thing is you avoid those awkward conversations that start with “About my Royalties” House Acapellas weighs in at 857MB and includes 155 24Bit Wav Samples at 44.1 KHz. The package contains 8 Stems from the Feeling Love Track, 20 Stems from Don’t Make Me Wait, 8 Stems from Saturdays, 7 Stems from Feel It In Your Soul, 14 Stems from Fabulous, 3 Spoken Word Male Speeches and 95 Male and Female Short Phrases.